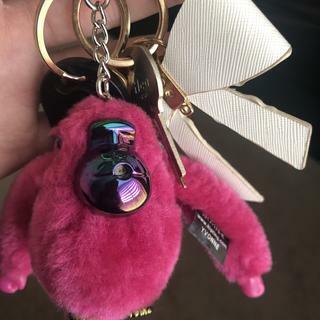 https://www.kipling-usa.com/lou-monkey-keychain/100244128.html Lou Monkey Keychain This playful monkey keychain is the perfect addition to any handbag, tote, or backpack. Lou's colorful iridescent face is sure to make you smile every time you pull out your keys or see it swinging from your handbag. This playful monkey keychain is the perfect addition to any handbag, tote, or backpack. Lou's colorful iridescent face is sure to make you smile every time you pull out your keys or see it swinging from your handbag. playful fun gift- girlfriend loved it. fun collectable that my girlfriend really enjoyed. I LOVE pink, I love the face and feet material are kind of a dark chrome, main reason I chose it; I do wish the hands matched the face/feet - seems odd that that they don’t - thats part of the reason I’m not rating it a 5. Biggest disappointment is that it’s NOT secure, it come right off of the carabiner - it happened once, luckily it was quiet enough I heard the thump and looked back to see it lying on my drive way, I have no idea how it came open, but it did and the monkey slid right off -for the price that’s charged, it should def be more secure. I would have been very upset had I suddenly looked down and my Yvonne was gone!!! Really cool look - kids loved the metallic face and color.